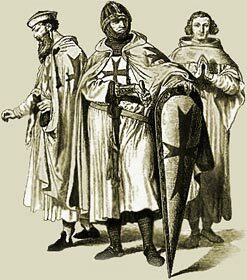 The law followed in a feudal court was largely based on old Germanic	customs. The court did not act in the public interest, as with us, but	waited until the plaintiff requested service. Moreover, until the case had	been decided, the accuser and the accused received the same treatment. Both were imprisoned; and the plaintiff who lost his case suffered the	same penalty which the defendant, had he been found guilty, would have	undergone. Unlike a modern court the feudal court did not require the accuser	to prove his case by calling witnesses and having them give testimony. The	burden of proof lay on the accused, who had to clear himself of the	charge, if he could do so. In one form of trial it was enough for him to	declare his innocence under oath, and then to bring in several "oath-	helpers," sometimes relatives, but more often neighbors, who swore that	they believed him to be telling the truth. The number of these "oath-	helpers" varied according to the seriousness of the crime and the rank of	the accused. This method was hardly as unsatisfactory as it seems to be,	for a person of evil reputation might not be able to secure the required	number of friends who would commit perjury on his behalf. To take an oath	was a very solemn proceeding; it was an appeal to God, by which a man	called down on himself divine punishment if he swore falsely. The consequences of a false oath were not apparent at once. Ordeals,	however, formed a method of appealing to God, the results of which could	be immediately observed. A common form of ordeal was by fire. The accused	walked barefoot over live brands, or stuck his hand into a flame, or	carried a piece of red-hot iron for a certain distance. In the ordeal by	hot water he plunged his arm into boiling water. A man established his	innocence through one of these tests, if the wound healed properly after	three days. The ordeal by cold water rested on the belief that pure water	would reject the criminal. Hence the accused was thrown bound into a	stream: if he floated he was guilty; if he sank he was innocent and had to	be rescued. Though a crude method of securing justice, ordeals were	doubtless useful in many instances. The real culprit would often prefer to	confess, rather than incur the anger of God by submitting to the test and ordeals. A form of trial which especially appealed to the warlike nobles was the	judicial duel - a trial by combat. The accuser and the accused fought with each other; and	the conqueror won the case. God, it was believed, would give victory to	the innocent party, because he had right on his side. When one of the	adversaries could not fight, he secured a champion to take his place. Though the judicial duel finally went out of use in the law courts, it	still continued to be employed privately, as a means of settling disputes	which involved a man's honor. Feudal Justice The Medieval Times website provides interesting facts, history and information about these great people and important historical events which scatter the Medieval History books including Feudal Justice. The Medieval Times Sitemap provides full details of all of the information and facts about the fascinating subject of the lives of the people who lived during the historical period of the Middle Ages. The content of this article on Medieval life and times provides free educational details, facts and information for reference and research for schools, colleges and homework for history courses and history coursework.